Well, it’s been a long time since I’ve posted something on here. You can tell that the summer must be starting. You’re seeing less & less of Greg in the virtual world. I’ll try to keep my updates / articles more often then I have the past few weeks. Since summer is finally here, I keep getting inspired to do some video, maybe more half-assed tv. But, I’ve been talking about that forever. Talk is cheap. You want to see a product. Well, maybe someday this summer I’ll surprise you. Who knows? I saw “Get Smart” yesterday. I used to watch the TV show all the time when it was on Nick at Nite, and then recently, I’ve been watching it on a local tv station called RTN, which plays old TV shows 24/7. The TV show is good, but I never thought it was hilarious. It definitely had it’s moments, but never like the Simpsons or Seinfeld to me. The movie differs a little from the TV show. Some of the technology they used in the tv show that looked very futuristic is actually ready available to any 10 year old. The patented “shoe phone” makes an appearance. But they really have some cool “James Bond” type gadgets. 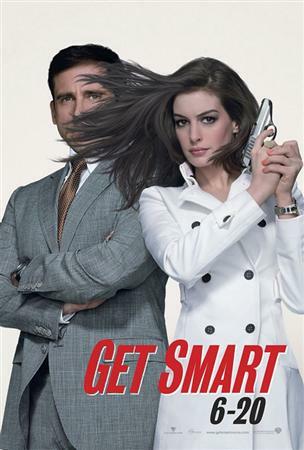 Steve Carell makes a perfect Maxwell Smart. He plays just as good as Don Adams did. Although, the movie version of Maxwell smart was not as clueless as the original was. Anyway, it was a great movie. Lots of action & lots of laughs. Oh and Anne Hathaway was hot! There was definitely a tivo moment in the movie where you wish you could pause the whole movie. She gets caught in here underwear for .00009 seconds. I definitely recommend the movie. It’s the best comedy so far this summer. Of course, it’s the only comedy I’ve seen this summer. hey.. the more frequent the Greg the better! – i’m going to be checking this movie out next weekend as part of a triple-header at the local drive-in with Wall-E and Prince Caspian.. – as far as Anne goes, if you really want to see the goods, peep out Havoc.. – i assume to distance herself from the “princess” image she did this indy film in ’05 where she basically sluts herself out for a Mexican gang.. – seriously..